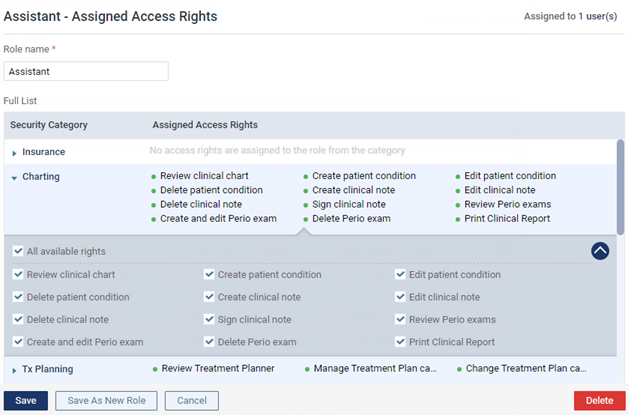 A user role is a set of security rights that you can assign to a user account to grant or restrict access to certain locations in your organization and/or certain features of Dentrix Ascend by location. Note: User roles are global (available to all locations across your organization). Create new - To create a user role from scratch, click (or tap) Create New. Base on existing - To add a user role based on an existing one, select a role that is similar to the one that you want to create. 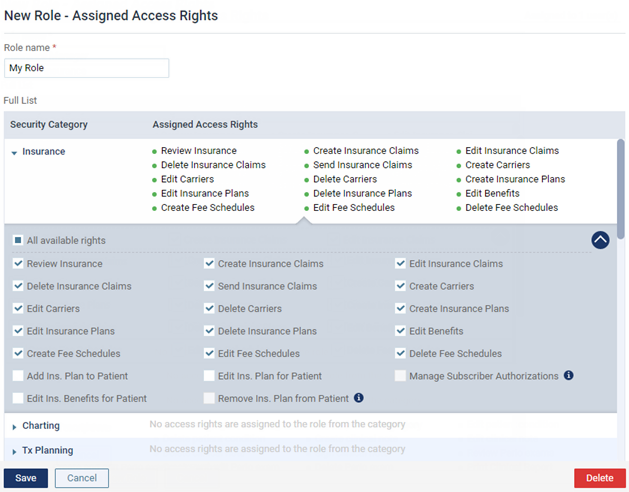 The options for creating or editing the user role become available. The options that are available depend on whether you are creating a new role or making one that is based on an existing role. For an all new user role, type a Role name (the role name must be unique). You can use a job position (such as Provider or Receptionist), a user name (such as John Smith or Millie's Rights), or some other convention. For a user role based on another, skip this step. For an all new user role, click (or tap) Save. 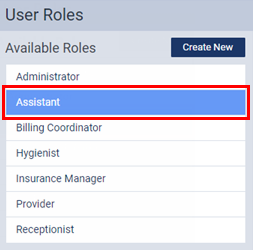 For a user role based on another, click (or tap) Save As New Role. In the New Role dialog box that appears, type a New Role Name (the role name must be unique), and then click (or tap) Save.